A cross-section of Swagelok's two-ferrule fitting. To download a PDF copy of the Tube Fitter's Manual, click here. When the Swagelok Tube Fitting was introduced in 1947, it provided a vast improvement over the other options for connecting tubing to pipe in the day: pipe threading, flare tubing connections, or the original compression tube fittings developed in the 1800’s. But that was 67 years ago. How does the design stack up in the 21st century? Over the years fluid system design has evolved from one of high volume at low pressure to today’s need for low volume at high pressure. These new demands call for increased internal and external pressures, vacuum levels, flow velocities, vibration levels, shock, and impulses. As a result, the mechanical demands on tube fittings, tubing runs, and other system-related equipment have increased accordingly. Swagelok remains ahead of the curve to make sure its two-ferrule fitting keeps living up to its global reputation for consistency, quality, and performance. I feel very fortunate to have worked for an organization that has made such significant design improvements to its flagship product that it qualified for three design patents for the products over the last 60-plus years. Anyone that knows anything about patents knows that you don’t qualify for a new 17-year patent unless you’ve made some significant design changes. Most people likely don’t know that we have a current patent for our Swagelok Tube Fitting that has been more than 60 years in development. Swagelok’s corporate culture encourages continuous improvement. Everything can always be done better. So why are two ferrules important in the swaging process? The design provides better tube-gripping action, reduced potential for improper pull-up, improved sealing in gas service, and vastly improved resistance to vibration. In a two-ferrule tube fitting design, the back ferrule moves the front ferrule forward to spring-load the fitting assembly, burnish and seal with the fitting body, and create the primary tubing seal. The back ferrule also swages the tube to provide the grip needed to keep the fitting and tubing firmly in place. To swage and grip the tube properly, Swagelok’s patented Sat 12 hardening process provides a recessed and contoured geometry of the back ferrule. This process creates a hinging and colleting action that grips the tube and provides more of the back ferrule to be in close contact with the tube to enhance vibration resistance. None of our other competitors use this patented, state-of-the-art process. Swagelok's two-ferrule system compensates for wide variations in tubing variables, including wall thickness, hardness of the tube, and material. Swagelok also provides a longer sealing path than other designs because of the way the back ferrule lifts up the front ferrule to its sealing position. This sealing position is not in just one point but along the complete surface of the fitting body. The back and front ferrules interact and seal according to the wall thickness, hardness of the tube, and the tolerances on the outside diameter of the tubing. Because Swagelok created the design and remains the industry leader, some people refer to any two-ferrule fitting as a Swagelok fitting, the same way that some people refer to any brand of facial tissue as Kleenex. Swagelok demands exacting tolerances in the manufacturing of our components. With Swagelok, you always know that the gap between the nut and the body will be predictable. Swagelok is the only manufacturer to actively promote the use of a Gap Inspection Gauge to make sure a fitting has been tightened the proper amount. Improper make-up and tightening remain the leading cause for tube fitting leakage. One of the biggest reasons why tube fittings fail is that installers sometimes rely on torque rather than the recommended 1 ¼ turn installation practice. But in our training classes, we demonstrate why it's not wise to go by feel, especially when different combinations of materials feel different during tightening. At Edmonton Valve and Fitting we put our reputation on the line by offering the Swagelok Limited Lifetime Warranty, which states that, "Swagelok hereby warrants to the purchaser of this product that the non-electrical components of the Product shall be free from defects in material and workmanship for the life of the Product. The purchaser’s remedies shall be limited to replacement and installation of any parts that fail through a defect in material or workmanship." No one else offers a lifetime warranty and will pay for the labour to install the products if they’ve been deemed defective. Swagelok paved the way all those years ago with its original two-ferrule design, and continues to set the industry standard. 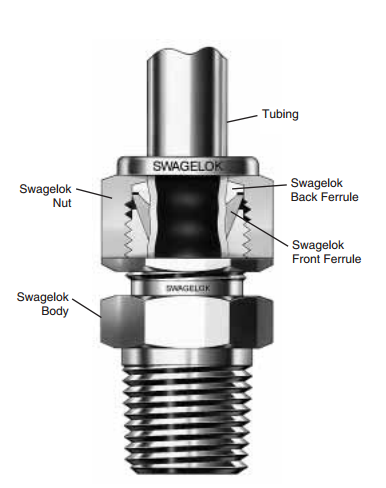 If you would like more information on the Swagelok tube fitting, download the Tube Fitter's Manual PDF here.